We produce for Italy and abroad mother's day moulds. 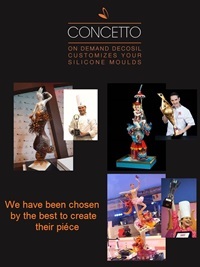 Italian leaders of silicone moulds, we create and sell for over 10 years mother's day moulds, food safe silicone moulds worldwide to confectioners, bakeries and Delicatessens. Moulds to create objects in chocolate, nice alternative to the classic chocolates. Ideal for Father's Day, Mother's Day, Graduation, Wedding Anniversaries. Many moulds to create chocolate objects combined together to give life to your creativity.